The death number from an landslide(滑坡) has risen to 16, with 21 people still missing in east China’s Zhejiang Province Friday night, local government said. Only one person has been rescued(营救) so far after the landslide hit a village. The landslide was reported at around 10:50 p.m. in Lidong Village of Yaxi Town of Lishui City.Mud and rocks buried 27 homes in the village, with 21 houses flooded. Rescue work began at once after the landslide. More than 2,300 people and 60 vehicles were sent. Zhejiang Province Governor Li Qiang is organizing the rescue. Only 10 people were found,but nine of them had died. The only survivor was in the hospital. 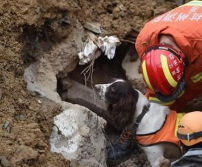 More than 2,300 rescuers, along with 7 dogs, are helping with rescue work. Search and rescue continued Saturday. Tents, food and water were sent to the village as part of the rescue after about 300 people were asked to leave the village. Lishui reported heavy rain over the past two days. As of 8 a.m. Friday, average(平均) rain had reached 36 mm. It was still raining when the landslide happened. 1. What happened in Lidong Village? 2. Which is NOT mentioned in the rescue? 3. The underlined word “survivor” means______in Chinese. 4. People died from_____in Lidong Village. 5. What’s the weather like when the landslide happened?